Oman Med J. Oct 2008; 23(4): 253–256. Henna leaf extracts have antimicrobial activity on the bacteria responsible for the common skin infections. Alcoholic and oily henna extracts have similar effects to some of the antibiotics commonly used in clinical practice. Lawsonia inermis (henna plant) has been used in herbal medicine for ages. However, the medical benefits of this plant have been discussed in only a few publications. In this study, the antibacterial effects of water, alcoholic and oily extracts of Lawsonia inermis leaves against bacterial cultures isolated from various skin diseases were investigated and compared with Tetracycline, Ampicillin, Gentamicin and Ciprofloxacin antibiotics. 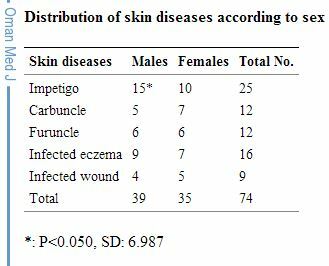 Cultures of Staphylococcus aureus Staphylococcus epidermidis (Co-agulase negative staphylococci or CONS), ß-hemolytic streptococci and Pseudomonas aeruginosa species were obtained from 74 (35 females, 39 males) patients with different skin infections who attended the Dermatology outpatient clinic in Basra General Hospital. 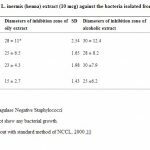 The bacterial isolates were treated with L. inermis extracts in vitro. Alcoholic and oily extracts were more effective than the water extract which had no effects using standard method of NCCL, 2000. Alcoholic extracts had the highest antibacterial activity with a MIC of 0.125-0.150 µg/ml against ß-hemolytic streptococci and against CONS was 0.125-175 µg/ml .Oily extracts had a MIC of 0.25-0.30 µg/ml against Staphylococcus epidermidis (cons). Both alcoholic and oily extracts had the same MIC (0.5 µg/ml) on Staphylococcus aureus. However, alcoholic extracts were more effective on Pseudomonas aeruginosa with a MIC of 0.5-0.57 µg/ml than oily extract (MIC of 0.20-0.28 µg/ml). However, there were no statically differences between the effects of oily and alcoholic henna extracts (p= 0.050). When comparing the extracts’ MICs with those of antibiotics, alcoholic extracts showed pronounced antibacterial effects against the isolated bacteria in vitro but oily extracts had much similar MICs to those of antibiotics and there are significant difference between effect of both extracts and antibiotics p>0.050. The skin has a complex flora. Infections can result when there is a breakdown in the integrity of the skin or when the immune defense is compromised. Common skin infections include cellulitis, erysipelas, impetigo, folliculitis, and furuncles and carbuncles.10 Many types of bacteria have ability to produce skin infections. Staphylococcus aureus is the most common cause of skin infections. It is frequently found in the nose and skin. About 20% of the population is long-term carriers of S. aureus.11 The purpose of this study was to evaluate the antibacterial properties of henna extracts in vitro and to compare them with Tetracycline, Ampicillin, Gentamicin, and Ciprofloxacin antibiotics. L. inermis were collected from private gardens in Abu Al-Khasib City in Basra. The leaves were left to dry at room temperature for 24 hours. The dried leaves were ground to a powder and were kept in dry containers. Three types of extract were prepared in the present study: oily, alcoholic and water-based extracts. The oil-based extract was prepared by mixing 50 gm of dried leaves powder of Lawsonia inermis with 500 mL of n-hexane for 24 hours. The solvent was then removed with a negative pressure to make 3 gm of oily henna extract. The alcoholic extract was prepared by mixing 25 gm of henna powder with 250 mL of 70% ethanol for 12 hours. This mixture was cooled and filtered by Buchner funnel and filter paper (Wattman No. 185). The solvent was dried and concentrated using Rotary evaporator at 50°C. Water-based henna extract was prepared in the same way except that distilled water was used instead of alcohol. 1. Determination of the inhibition zones (mm) and minimum inhibitory concentrations (MIC). 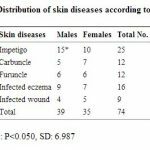 Note: One typical species from each bacterial skin infection was selected for the study. The total isolates were 5 for each bacteria study. 1. Singh M, Jindal SK, Kavia ZD, Jangid BL. Khem Chand. 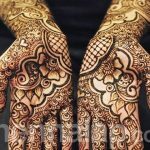 Traditional Methods of Cultivation and Processing of Henna. Henna, Cultivation, Improvement and Trade: 21-14. Jodhpur, India: Central Arid Zone Research Institute, 2005. 2. Harborne SB, Baxter A. Phytochemical Dictionary. A handbook of bioactive compounds from plants. Tylor and Francis. London, 1995. 3. Blanks T, Brown S, Cosgrave B, Woody J, Bentley V, O’ Sullivan N, et al. The Body Shop Book of Wellbeing Mind, Body, and Soul. Ebury Press London. 1998 p. 173-192. 5. Hemem SS. Activity of some plant extracts against common pathogens in bacterial skin infection: thesis MSc, College of Education, Basra University, Iraq, 2002. 12. Colle J, Fraser A, Marmion B, Simmans A. Mackie and McCartney. Practical Medical Microbiology. 14th ed. Churchill Living ston. New York, USA. 1996 p. 978. 13. NCCL. 2000. Antibiotic susceptibility methods. CLSI. 15. Maki HA. (1983). Isolation and Identification of pathogenic bacteria encountered in cases of wound infection with their Antibiogram pattern. M. Sc. Thesis, College of Medicine, Univ. Baghdad.